“My name is Timothy Ferguson and I was Michael’s brother. A good friend encouraged me to speak on behalf of my brother even though the pain of our loss is still very raw. Today, I will speak of a unique man who I had the honor and privilege of knowing all my life, and I will speak to his uniqueness as it is cherished by his friends, colleagues, family and me. The tragic loss of Michael, his wife Theresa and my stepmom, Maggie, are difficult to compute and know. As I try to begin to heal, I think of Michael and the wonderful relationships he had with so many. Michael John Ferguson was the youngest child of six by Mary Moore and Matthew Ferguson, born June 6th 1966, on the sixth floor of St. Vincent Hospital, at 6 lbs., six ounces, born the sixth child at 5:30 pm. Michael’s siblings consisted of Matty the oldest, then Terry, Mary Kate, Andy, and myself. Like any typical family growing up in Greenwich Village, we grew up fast and watched out for one another especially the youngest. It wouldn’t be long before Michael would look after us. Under the tutelage of the Ferguson Clan, Michael would come to embody all the good qualities of his parents, older brothers and sister. From Mary he would gain self confidence; from dad, boundless energy; from Matty he would learn of toughness and perseverance; from Terry, humor and loyalty; from Mary Kate, calmness under pressure; from Andy, friendliness and strength; and from me, my affection. Michael blended these good qualities and made them a part of who he was. He became our “prince”. At a young age Michael began to show himself to be a fierce competitor and a loyal brother, and on many occasions would come to my side. I remember fondly the time spent backpacking in the British Isles and Australia. Michael, all of fourteen, would accept Andy’s rulings and my guiding, but it was Michael who managed to keep the two brothers from killing each other. Though Michael was the youngest, it was apparent at an early age that Mike was destined to be the beacon of the Ferguson family. Our time growing up in NYC, the Hamptons and the Adirondacks gave Michael an appreciation for the outdoors. Mike would spend time in the woods or on the lake or in mountains discovering the beauty and cruelty of nature. The ultimate sportsman, he would fly fish, hike, bike, climb, hunt with both bow and rifle, snowshoe, and cross country ski the Adirondack mountains. He would come to own a piece of this beauty and call it Corleskin. He would come to embody the Highlands and make his mark there too, as Chairman. Whether it was planting trees or planting fodder for Whitetail for upcoming harsh winters, Michael unceasingly explored his life with nature and worked to conserve its beauty. Michael would share his knowledge of the woods with his love, Theresa, and his nephews, nieces and friends. For the last 15 years Michael would lead the Annual Hunt for the illusive Whitetail Deer. The first week in November, Michael would have 15-20 guys converge on Highlands to try their skill at the hunt. Inevitably, deer would be taken, and thanks to Michael, the hunt-master, all would be safe. Hunting with Michael was most often the highlight of our year. Although there were times when things were not going so well, Mike would keep everyone focused on safety and would come out with a one liner, “Now let’s go out and throw some lead.” All of us will remember our time in the woods with Michael for it was joyful, full of laughter and friendship. Michael was many things in his life including, son, brother, husband, colleague, and friend. I have come to know Michael better this past week from his colleagues and friends and I found that the things I treasured most about him they did too. He was my best man at my wedding and godfather to my eldest son, Timothy. He was there in the best of times and around in difficult times. He did not shy away from his family and friends in times of the difficulties of divorce, addiction, loss of job, or traumatic injury. In fact, Mike would put himself in your business and truly try to help, even when it seemed hopeless. He was like an action figure. He didn’t just make an obligatory call, he would show up at your doorstep and he would tell you what you needed to hear. He was a confidant of sorts and I would learn this week that he was this to so many people. Michael was good natured, kind, and funny, and even when he teased you he would lean his head back and laugh deeply, but in a way that wasn’t hurtful but that made you laugh at your insecurity or the situation. His gift of wit was only surpassed by his energy. The day before his death, he would bike 40 miles of Adirondack Mountain trails (in his red sequined riding gear), plant a tree, clear a trail and stop by and say hello. I invited him about a month ago to come to Norwalk to go fishing. When he arrived, I asked if he would lend a hand fixing the fence damaged from spring storms. Within five minutes he was dirtier and sweatier than me. The two contractors and my sons were glad he showed up. Eight hours later, bruised and blistered, we would laugh that Michael got all the hard holes to dig, and he agreed with a smile. Mike came to fish and he spent the day helping his brother. He would give his time to many a sibling and friend I would find out. I recall when Michael told me he was coming to school with me at Providence in 1984. We had never been in the same school before so I was excited and surprised. Having a younger brother at the same school meant introducing him to all my junior collegians and telling them to watch out for him. Michael was soon absorbed into my fraternity of friends and gained a reputation for being a gentleman only comparable to Fast Eddie. He would later room with many of my friends, including Joey Montauk, while establishing himself in NYC with Cargill. He dated the prettiest girls and, although he played a few rugby games in which he sustained a horrific concussion, he would remain as the club’s president for his Junior and Senior year. Most of the team showed up as his funeral. He worked hard, he played hard, but most of all he loved deeply. People respected him, and in some way Michael had become an older brother to me. He would keep a check on me and many other people. The transition from little Fergie to Fergie was quick. Michael was always dressed impeccably, thanks to Theresa, and was always the gentleman. I remember a funny story when we were golfing a memorial golf outing for Tommy O. I was paired up with my brother Andy, with Michael and Billy in the other pair. We would begin laughing at the first hole and not until the moment we said goodbye would we stop. Michael, ever the prankster, kept unstrapping the golf bags on his unwitting adversaries causing our clubs to tumble off the back of our cart, all over the fairways mostly. Not once, not twice, but nine times. Andy and I warned him that if he did it again we were going to beat him up. Andy is an imposing figure so I figured we didn’t have to spend more time checking and rechecking the straps, when on the back nine Michael struck again. Andy and I tracked him down but when I saw Andy beating up my brother I had to jump to save Michael. Andy got the raw end of deal as I think Billy jumped in too. We knocked each other down but helped one another back up, and we knew we loved each other. We just laughed. So many stories like this one where Michael would be uniquely funny. Being closest in age of the siblings and looking most like Michael, I found myself surrounded by Michael’s colleagues from work who wanted to share their depth of loss. As they described his character, I knew it was the same Michael that I had come to love. Most the stories started with “Michael helped me when…” Michael was the best boss, mentor, colleague, customer, and friend. Michael was Managing Director for BP Paribas and was responsible for over 200 employees working in oil derivatives, etc. All would say that they had lost their “captain.” People came in from Houston, London, and South America. It turns out, he keeps in touch with a lot of people in a lot places. They found Michael to be what I found Michael to be which was that he was always there when you needed him. He was the consummate loyal friend. In fact I remember Michael telling me about how he was heartbroken about laying off 28 employees last year. All 28 former employees showed up at the funeral because he cared about them and they knew that. His colleagues would recall gatherings where Mike and Theresa would brighten a conversation and room. Together they would make their mark. There is a painting my mom painted 40 years ago depicting, in late autumn, six children walking up a snowy incline with grayish green ponchos, snorkel coats and hats of assorted colors. The children’s backs we see are the six Ferguson kids in the Highlands on a cold, rainy, windswept day. We know who each kid is, not being able to see the faces, but one figure walks up behind the pack, the smallest, perhaps the youngest. Was he trying to catch up? Or was he just looking after us? Michael and Theresa please watch over all of us. FERGUSON – Michael John 44: Beloved husband, son, brother, uncle, nephew and cousin. Michael John was managing director of marketing and sales for the commodities derivatives division of BNP Paribas, NY. Chairman of Highlands Forest and a life-long Adirondacker, he was adored by his 20 nieces and nephews. Michael’s generosity of spirit, wisdom and humor will be missed by all who shared his life. A funeral mass will celebrate the lives of Michael John and his wife, Theresa Renz Ferguson, at St. Paul the Apostle, 2 PM Monday, July 12, 405 W. 59th St., New York. Reception to follow at 3:30 PM at the Princeton Club, 15 W. 43rd. In lieu of flowers, donations may be made to the Fresh Air Fund. For more infomration and to share memories, please go to: www.michael-theresa.com. Click on the image of the letter to view a full size PDF. It’s with great sadness that we announce the passing of Michael Ferguson, Managing Director and Head of Sales Marketing & Trading Operations Commodity Derivatives in New York. Michael and his wife, Theresa, tragically died in a small plane crash on Monday evening in Fairfield, N.J.
Michael was a consummate professional who was with the Bank for 16 years. 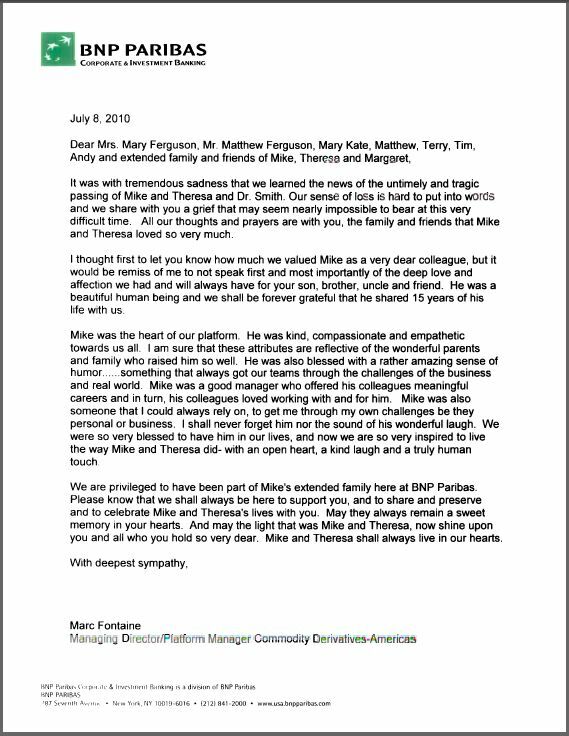 On behalf of BNP Paribas, we offer our deepest sympathies to Michael and Theresa’s families. This is a tragic accident and a great loss. Please accept my warmest sympathy to the whole family. Dr Smith was such a great loss to Medicine. She was such a Doctor and what a Lady always the same. I was one of the selected SVH student nurses to babysit for the Ferguson children. That was 39 yrs ago. It was a big house and many children. Many students came before me but didn’t last. I was there for almost a year, after freshman year, our hours of work changed. I’ll never forget I got there to babysit only 17 myself, and many smiling faces to greet me. Well after the parents left, Micheal gave the “signal” and it all started: up and down and down and up the stairs. I thought it was a circus. We finally sat down and had a little chat and all settled down with Micheal as “the boss” I loved coming weekly to babysit and have fun with such great kids. I’ve worked with Tim over the past few years and it has been a pleasure. Tim, my heart goes out to you. Deepest sympathy to Therese’s family and friends. I’m sorry I will miss the service as I will be out of town. I will be there in pray. Tommy O (above) was like a 6th brother in the Ferguson household and we mourn his passing 6 years ago this Tuesday, the 13th. We will be putting more stories, letters and pictures of Michael here soon. If you have any stories or pictures to submit email them to todd@toddsmithphotography.com, or leave a comment below. It was a pleasure and honor to work alongside Michael, he was the consummate gentlemen. May God bless Michael and Theresa. Michael John was my intrepid bow man in the “The Log” – a decidedly un-hydrodynamic Coleman canoe that he and I paddled down 300 miles of Alaskan river in the summer of 1987. We took two strokes for every one in the other two, sleeker canoes. I started out with my brother in bow, but he wouldn’t put in the work to keep up (love you Ax! ), so I asked for Michael, and we kept up and more. That was the kind of guy Michael was. Strong, reliable and “true blue”. I’ll miss you Michael. I know you’ll keep St. Peter’s bow out of the rocks and “shoot the Vs” of heaven with Theresa, but I sure as hell wish we could have floated more rivers here on earth with you. Although we will remember him as a dedicated co-worker, foremost of all he was a good friend. It is this friendship he shared, along with his love for life, Theresa and family that will be forever etched in our memories. And with these memories, may we never forget how he touched our lives. God bless them and may they rest in peace, partners for eternity. My heart is broken having lost my friend of 30+ years. Something in how he said this got me and I put the work on hold and spent 12 hours with him laughing, giving each other grief (as he told me to swing my hardest and I did, first missing the ball completely and then with a mulligan out of the way, I out drove him on the fly-I gave him the business for that!!!! ), and chatting about life. I got to chat with Theresa around 12 AM on speaker phone in Mike’s car on the way home. As always, I was immediately at ease talking with her and the three of us were laughing hard within minutes. Thanks, Mike. I never understood, “you only live once” like I do now. I’ll miss both of you dearly! I was fortunate enough to have known Mike for the past eight years or so. He was always full of energy, and his fun-loving demeanour was infectious. Even though I was a customer of his, I felt I was never treated as “just a customer”. Mike took the time to know you, and every time we got together, work was the last thing we talked about. I smile every time I think about calling the desk, and have Mike answer the phone “Michael Ferguson, broker to the stars”. I always knew Mike and Theresa would be together forever, I just wished it could have been down here with us. May God bless them both. I first met Michael in October 1982. I was at Providence with his big brother Timmy who I quickly befriended over a love of The Who. I had a couple of tickets for the Shea Stadium show with The Clash and Timmy suggested we go together. I drove down to the city with a bud from my hometown, and arrived in Greenwich Village around the dinner hour. I came to the door and Michael was there to greet me. My first reactions was that he was actually Matt Dillon! Real handsome kid. I introduced myself, and naturally, asked about food. He said, “Ray’s Pizza, right there at the end of the street.” So we went and had Rays. An hour later, we met up with Timmy and he told us he had steaks from Jefferson Market. Michael had a big laugh after Timmy grabbed him in a headlock and nuggied him a little. We all became immediate friends. Later on when he came to Providence, he was immediately accepted into our circle of friends and he became another brother of mine like Tim, Pete, Walshy, Andy, Kevin, Joe, Paul…the whole gang. Years passed and I enjoyed a few hunts with him upstate. Although I never took a buck, I definitely got cramps from laughing too hard with Michael and the crew around the table (especially when Doc Ferguson cooks only one pork tenderloin for 8 starving men!!! Ha! )…Well, I’m really gonna miss Michael, and I know death is a part of living and all the circle of life stuff, but man, it was way too early. I won’t forget Michael and the effect he’s had on my life. Godspeed and bon voyage Michael. Micheal was special. It is hard to define what made him so. Maybe that is because he possessed so many of the characteristics that we would all like to have. He was fun, vivacious, and caring. What stands out most though in my mind is how positive Michael was. There was never a situation he couldn’t handle or challenge to great for him. He had a calmness and a purpose about him that was unique. In Theresa, he found the perfect partner. They were so much fun to be around. Always joking and teasing each other. We had the pleasure of their company recently and it was just like when they first meet. I’m blessed to have had their friendship for so long and will miss them dearly. This prayer to St Micheal reminds me of two of the most wonderful people I will ever know. Mike and I worked together at Cargill and years later he hired me to work at BNP Paribas. He and I were driving on the highway on a business trip in Ohio when Mike shouted, “OH MY GOD”! I grabbed the dashboard with both hands and shouted back, “WHAT”! On the left side of the highway in the middle of nowhere was a huge Cabela’s warehouse. I love the outdoors but I am not a hunter so I had no idea what Cabela’s was. Of course Mike was appalled that I did not know about this place and said that the fish tank alone was worth a visit. I honestly thought he was going to drive across the divider to get to this store. We spent about an hour in there and needless to say I was pretty amazed. And of course Mike was like a kid in a candy store. In my opinion, New York City and the entire world have been changed by the loss of Mike and Theresa and the commodity futures desk at BNP Paribas will never be the same. I feel priviledged to have known them and may God bless them. Words are difficult to come by in expressing my friendship with Mike. I remember vividly my first “interview” of Mike when he was at Cargill before joining us at the then Paribas Futures. He, peering out from under his throw-back “Flock of Seagulls” bangs at the NY Athletic Club doing his best to match my intensity only to end the evening “well served” laughing our butts off. That was only the beginning. Through the years, Mike and a number of us came of age in our professions, relying and depending upon each other to get through each week as the demands, challenges and successes mounted up. It was nothing less than thrilling. Mike’s ability to be both instantaneously intense and humorous were his hallmarks. Watching his relationship with Theresa grow and evolve was a delight. These were two strong and true individuals that brought themselves into a committed relationship. It was their sense of self and their love of each other that made that relationship what it was, two hard chargers ready to take on life. Mike was my colleague, my confidant and my friend. He was, as they say, a unique. He will be deeply deeply missed. A dear friend, colleague, mentor, and the personification of class, Michael had a rare combination of qualities that set him apart from others. Beyond his fun-loving, charismatic, and energetic persona, Michael was fiercely loyal and selfless. The mere mention of his name elicited responses such as “one of the best guys you’ll ever meet,” or “Fergie – what you see is what you get.” As previous posts have recognized, Michael was truly special. If there was ever a match for Michael, it was Theresa. Anyone that spent any time with them knew they were meant for one another. Equally as strong, smart, sophisticated and worldly, Theresa was always a pleasure to be around. Her smile and warm personality could light up a room. It was fantastic to watch their love grow over the years. When I first met Michael, I was just starting out in the professional world. He quickly became someone I looked up to; he was the epitome of excellence, both personally and professionally. As our friendship grew, he looked after me as if I were a younger brother. Whether it was taking in a hockey game, chatting about life over a beer, or just coming to work, I always enjoyed our time together. If I was ever in a bind, or needed a helping hand, he was the first person to offer assistance. I sought his advice and guidance often, and was always warmly welcomed. Michael, words can not begin to describe the indelible mark you have left on my life. I will always remember your expressions (“look at you, you’re all grown up, kid!”), your laugh, and your passion for family, friends, and life. I’m privileged to have shared so many wonderful moments with you and Theresa. Michael and Theresa – our love for you will never dim; you will remain in our hearts and thoughts always. Words cannot express the sorrow and loss we all feel. He was my colleague and my friend for the past 17 yrs and I will truly miss him. His razor sharp sense of humor that made me laugh every day. His business savvy that made me strive to be the best I could be. His ability to make everyone around him feel secure and comfortable. Those are gifts we received daily and will be missed deeply. Mike’s life may have been cut short but he lived his 44 yrs to the fullest. He was a sharp Wall Street banker during the week and a camoflauge wearin’, deer guttin’, Budweiser drinkin’ country boy on the weekends at his cabin. I guess you can say he lived 2 lives in those 44 yrs. He had a big loving family, a successful career and a beautiful, elegant wife in Theresa that totally completed him and made him the man he was. He was truly happy and blessed. Michael J. Ferguson…You were truly a success! Rest in peace my friend. I worked with Mike — Fergie — for a few years in the early/mid 90s at Cargill Investor Services and bumped into him a couple of times thereafter. I remember him simply as a very good, fun-loving guy (and have a particularly fond memory of watching a Rangers playoff game with him in a Manhattan bar in 1992). My heartfelt condolences to the Ferguson and Renz families on this unfathomable loss. God bless. Please remember all the good that was brought by the ones we lost and please smile in remembrance for they would wish us to. When Michael and I were eight years old he taught me how to make English muffin pizzas, when my son Jack was eight Mike taught him to shoot a .22 with the utmost respect and safety. The most difficult times I have with this loss are when I selfishly think about how my life and my children’s lives are changed forever, Alexander who is now 7 will not get the chance to shoot with Mike. The easier times are when I focus on how Mike and Theresa’s too short lives did add so much to all of our lives. That they asked my wife Suzanne and me to share their wedding table is an honor we will always treasure. I only hope and pray we let them sufficiently know how much it meant. Michael got more out of a day (and night!) than anybody I’ve ever known. Mike was a superior woodsman, threw a mean punch with a hockey glove on, could crush a spaldeen and was a tremendous lover (by his own account). Man, was he fun to laugh with. Mike balanced success and humility, competition and compassion, determination and acceptance. Accepting he is gone is made more difficult because he is not physically here to help us do it. As children and adults he always knew what we all should say and do when difficult things happened. He achieved a lot personally and professionally while always bringing as many of us along as he could. He is exactly the man we need right now. I believe he is with us all right now. I feel him with me and know he will be there for me now, as he always has been. One thing we can all take away is that Michael’s last day was spent traveling between two places he loved with two people he loved. I loved Michael John and thank God for knowing him. About 6 or 7 yrs ago, Mike and I went on a business trip together down to Houston. We had a dinner set up with one of our clients and I called to confirm with them…they suggested instead of doing dinner, they would like to invite us to the Houston Rockets game..they said their company had good seats…so we went to see the Rockets play the Clippers…when we got to the arena we were pleasantly surprised to find out that the “good seats” were actually floor seats at half court. it was amazing!! We didnt just watch the game, we felt like we were part of it..especially when a loose ball came flying towards us and a Rockets player ran into us. The game went into double overtime and the Rockets won…After the game our client dropped us off at our hotel..of course we had to stop at the bar and have a few beers. While at the bar, ESPN Sportscenter started showing highlights of the game…They showed the winning bucket and Mike and I were in the camera’s view high fiving each other…It was a great night…To this day it was the best time i’ve ever had a sporting event. I’ll never forget that night. Michael John a legendary man whose companionship I will forever miss. His adventurous spirit will always define him and like Thoreau, Adams and Cole inspire us to find solace amongst the towering cedars, deep blue lakes and granite outcroppings. I graduated with Michael from PC in 1988. What I remember most was that when I was with him, I was always laughing!! He had an infectious smile and was always happy. I went through (what seemed at the time) a difficult breakup our senior year and was “taken in” by Michael. We spent many nights at Louie’s with me crying over .50 beers!! When I look at these pictures I see the same Michael. I am so happy that he found love with an amazing woman…he deserved it! I will pray for your families. Tough to believe it’s been a year. We think and talk about you often. So many things remind us of you both. You are sorely missed. Mike and Theresa thinking of you Both a great deal today, can’t believe its been two years, you are missed as much today as you were on the fatal day.